Australia's own Gestalt Comics have never failed to satisfy. Not many publishers, big or small, can boast a stable of creators and releases of as high a quality as our Aussie comrades. Whether you're after fantastic horror in Torn, Changing Ways and The Eldritch Kid, a brilliant all-ages romp in The Deep or the quirky Vowels and Waldo's Hawaiian Holiday - Gestalt have got you covered. It looks as though Gestalt will continue to please with the impending release of Stalag-X by artist Mike Ratera and fan-favourite sci-fi legend Kevin J Anderson. Follow on after the jump for full details! 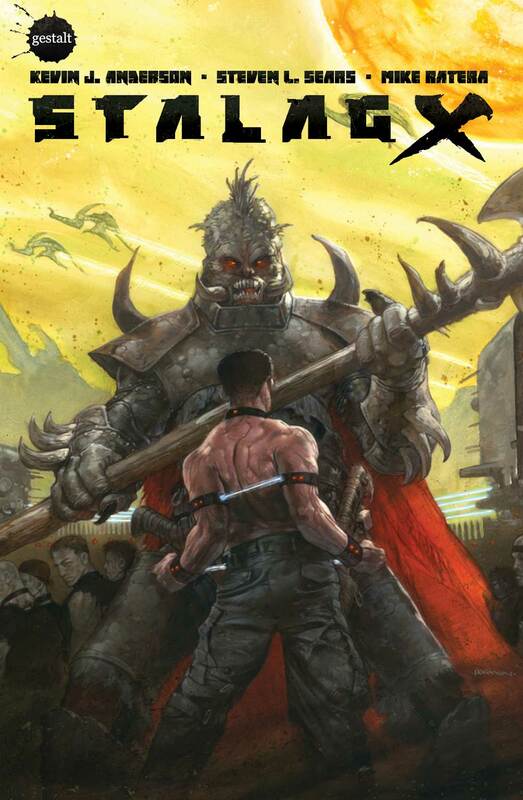 WA-based Gestalt Comics are pleased to announce a major new science fiction comic series, STALAG-X, a candid tale of human soldiers struggling to survive in an alien concentration camp. Written by award-winning author Kevin J. Anderson in partnership with TV writer/producer Steven L. Sears, and illustrated by Mike Ratera (X-Men, Bad Legion), Stalag-X reinterprets the eprisoner-of-warf tale with a compelling antihero bent. In a devastating interstellar war with an alien race, one prisoner - known only as "Joe Humanh" - is taken to a harsh P.O.W. camp that is controlled by a sadistic alien the captives refer to as Mengele". Like his namesake, Mengele performs horrific experiments on humans to better understand their nature 'Know your enemy' is the dictum under which he operates, even if it means examining them slice by slice. Joe quickly appears to be less than honorable, for he has his own reasons to stay incognito and off Earth. While held prisoner at Stalag-X, he uncovers vital intelligence about the enemy - information that could possibly win the war and save billions of livesc Of course, that would mean getting involved and, perhaps, caring for something. Or someone. Sears is well-known for his work in both film and television - his writing and producing credits include some of the most iconic television series such as Superboy, The A-Team, Swamp Thing and Xena: Warrior Princess among many others.